Welcome to the Wudang Dragongate Kungfu School! Authentic Wudang Kungfu since more than 20 years: Taichi (taiji), qigong, kungfu, meditation, daoist philosophy and wudang culture. Join us for an unforgettable experience. Beginners and experts find what suites them best. Individual training and various arts. Self-cultivation, activation, relaxation, as well as sports and self-defense. Maybe you want professional and serious training for 7 hours a day. Maybe you seek for a health retreat to balance your body, mind and soul. Internal daoist kungfu and art of wudang is versatile and provides all aspects of natural movement: fast, slow, high, low, powerful, relaxed, round and straight. 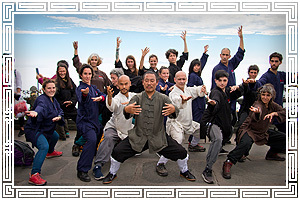 Wudang arts will provide a whole different way of seeing and experiencing the world. Master Wang, born in wudang, head of the wudang dragongate lineage, is the center & soul of the Wudang Dragongate Kungfu School. He is sharing his arts diligently. All people, all ages, all nations are welcome! Taichi Discover one of the most famous secrets of Chinese Martial Arts. Slow but fast as lightning; soft but effective for defense & fighting. Taichi (Taijiquan) is Balance in Motion. Taijiquan was born in Wudang. We offer authentic wudang dragongate Taijiquan & much more like push hands and all other aspects as breathing, qi flow, applications, internal & mental aspects. Wudang Kungfu has many different styles. All are internal. All are based on wudang daoist religion & principle. Natural movement used fiercly to all sides at all speeds. Wudang Kungfu has strong stances, smart applications, has tremendous health benefits and simply looks super beautiful. Meditation Whenever you want to discover your internal energies, learn to control them, refine them or use them for internal alchemy, then there is nothing better than daoist meditation. Rarely you find good teachers. We offer very prfound and authentic classes for meditation. There are many reason why Qigong never disappeared in a history older than 5000 years. Today it is known world wide. Whereas real wudang qigong is a whole different experience. It is based on thousands of years of shamnic daoist practices of hermits in caves & daoist priests in wudang temples. Common Qigong often stops at the point, where we think, the magic just starts. For self-healing & arts that refresh your whole being try some of our amazing qigong sets. Bagua, the palm of the 8 trigrams is a vivid style: round & effective. Bagua dynamically moves to all sides. Walking in circles is fundamental to this art. Circles, throws, kicks, palm strikes & finger thrusts: find your way to enormous energies and try not to feel dizzy. Xingyi probably the most forceful of all internal martial arts of Wudang: centered attacks; fast & absorbing defense; powerful steps; full body force. Xingyiquan means: boxing with using the body & the mind in perfect harmony. If you want to feel the full power of a strong ocean wave, go surfing or try Xingyi. Combine a full body workout with grace, speed and flexibility. With us you‘d then devote yourself into the most sophisticated art of war in ancient China: Wudang Sword Style. Old Chinese sayings call the sword “king of weapons” and “weapon for kings”. Sword training improves concentration, precision & strength. A weapon designed to develop true mastery.